This article is about the traditional state. For for the city formerly named Zazzau, see Zaria. The Zazzau, also known as the Zaria Emirate is a traditional state with headquarters in the city of Zaria, Kaduna State, Nigeria. As of September 2015 the emir was Alhaji Shehu Idris. Our most important source for the early history of Zazau is a chronicle composed in the early twentieth century from oral tradition. It tells the traditional story of the foundation of the Hausa kingdoms by Bayajidda, a culture hero and gives a list of rulers, along with the length of their reigns. According to this chronology, the original Hausa or Habe kingdom is said to date from the 11th century, founded by King Gunguma. 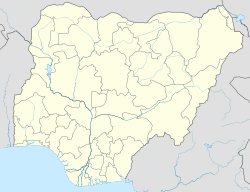 This source also makes it one of the seven Hausa Bakwai states. Zazzau's most famous early ruler was Queen (or princess) Amina, who ruled either in the mid-fifteenth or mid-sixteenth centuries, and was held by Muhammed Bello, an early nineteenth century Hausa historian and the second Sultan of Sokoto, to have been the first to establish a kingdom among the Hausa. Zazzau was a collection point for slaves to be delivered to the northern markets of Kano and Katsina, where they were exchanged for salt with traders who carried them north of the Sahara. According to the history in the chronicle, Islam was introduced to the kingdom around 1456, but appears to have spread slowly, and pagan rituals continued until the Fulani conquest of 1808. At several times in its history, Zazzau was subject to neighboring states such as Songhai, Bornu and Kwararafa. In December 1808 the kingdom was captured in the Fulani jihad. The Hausa ruler had escaped to Abuja, where he established a state now known as the Suleja Emirate, retaining his independence and the title of "Sarkin Zazzau". The ruler of the modern Zazzau Emirate also uses the title "Sarkin Zazzau" or "Sarkin Zaria". After the jihad, the culturally similar but pastoral or nomadic Fulani intermarried with the more settled Habe farmers, and the people of the Emirate today are generally known as Hausa-Fulani. The government of the Zaria Emirate differed from other emirates created at this time in that offices were rarely hereditary, but were appointed based on merit or obligation. Dan Isaacs (September 28, 2010). "Nigeria's emirs: Power behind the throne". BBC News. Retrieved 2010-09-29. ^ Isa Liman (4 January 2010). "Zazzau Emirate Council to Send Man Who Lost Private Part Abroad for Treatment". Daily Trust. Retrieved 2010-09-29. ^ "Zaria". Encyclopædia Britannica. Retrieved 2010-09-29. ^ a b M. G. Smith, International African Institute. (1960). "Government in Zazzau, 1800-1950". Oxford University Press. Retrieved 2010-09-29. ^ a b c d "Traditional States of Nigeria". WorldStatesmen.org. Retrieved 2010-09-01.